Under Armour® started in 1996 as a simple plan by founder Kevin Plank to make a superior T-shirt for athletes – a shirt that provided compression and that would wick perspiration off the skin rather than absorb it. Plank, then 23 years old, produced shirts out of his grandmother’s basement and at the end of 1996 had $17,000 in sales. Under Armour® has experienced extraordinary success and growth over the years, now selling their products around the world. Revenue in 2015 reached $3.96 billion and the growth continues with a 2016 forecast of $4.96 billion! To successfully support this volume of sales, the company has had to create and maintain some of the largest manufacturing and distribution centers in this industry. In 2014, Under Armour® began building the 2 new distribution centers – one on the west coast (Rialto, CA) and one in the east (Mt. Juliet, TN). To pull this off, they needed to work with companies who had solid, proven track records in terms of engineering expertise, product quality, and the ability to deliver the volume of installed equipment on the timelines required. PACLINE was chosen to provide the overhead monorail conveyors for empty carton and tote handling for both of the new Under Armour® facilities. The larger of the two new distribution centers for Under Armour® was being built in Mt. Juliet, Tennessee. This facility would occupy over 1 million square feet. The empty carton and empty tote conveyor systems were to be fully integrated with the other roller and belt style conveyors in the picking and packing areas – over 12 miles of conveyors in all would be installed in this facility. Under Armour® needed to deliver and remove both totes and cartons between different packing areas and on two different levels. 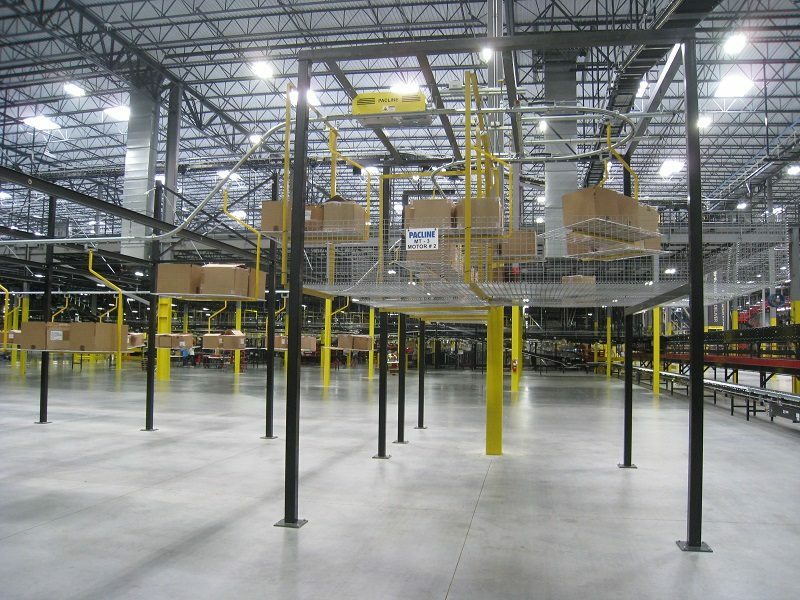 Space was at a premium due to the extensive floor conveyor systems and packaging and staging equipment. Of the 12 miles of conveyors installed at Under Armour® in Tennessee, 1.2 miles was PACLINE’s enclosed track overhead conveyor for delivering and removing empty cartons and empty totes. Deliver empty totes from the main level Value-Added-Services (VAS) packing areas to be consumed in the 2nd level Distribution/Packing Areas. Remove empty corrugated cardboard cartons from the 2nd level Distribution / Packing Areas to be consumed at the main level Value-Added-Services (VAS) packing areas. Both overhead monorail conveyor loops pass through a small area – a combination trash and new carton make-up area, as well as a tote re-balancing area – to ensure the proper mix of cartons and totes before entering their respective Distribution and VAS areas. Each tray carrier tray was designed hold 2 cartons or totes. 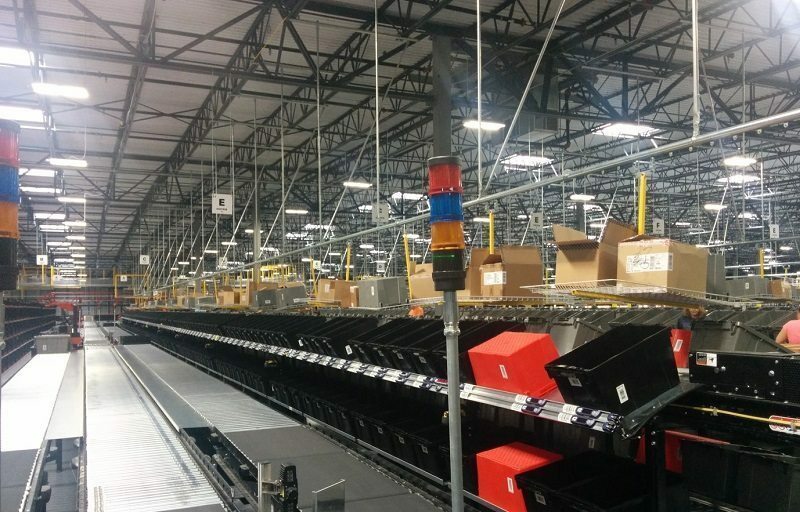 To address the space constraints, PACLINE was able to weave the overhead conveyor system in and out of some rather tight areas. 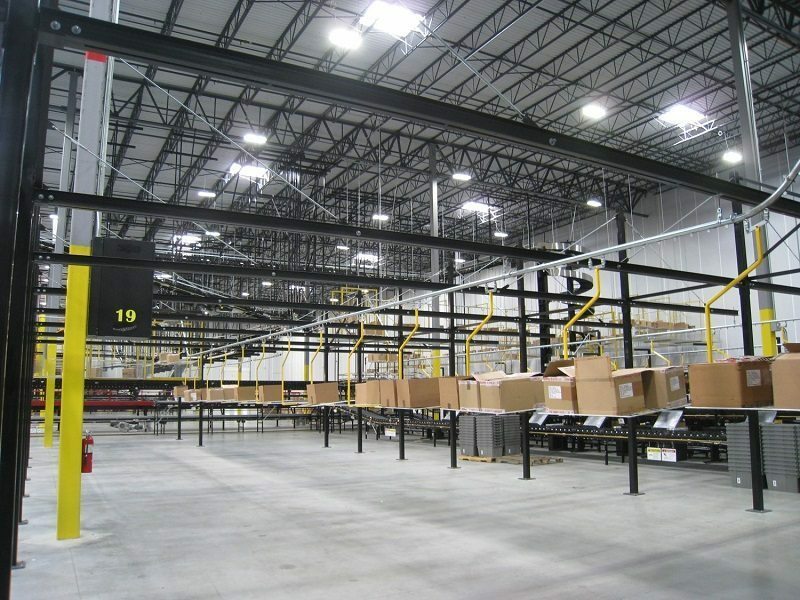 Also, where needed, the PACLINE conveyor was hung from the mezzanine and ceiling to ensure easy loading and unloading access for the various packing operators, while avoiding the creation of additional obstacles. To further minimize floor obstacles and avoid hanging very long steelwork from the ceiling in one area of in this very tall building, Pacline designed an efficient suspension bridge style of structure for the shortest of the three overhead conveyor loops (830 ft.) This allowed floor supports to be located well away from the operator areas, yet provide a stable, cost-efficient conveyor support structure. Pacline provided the control panels for the overhead conveyors that were fully integrated with the master floor conveyor control panel to communicate and display data on a single touch screen display (HMI). The small ‘footprint’ or floor space area, used for a combination carton trash, recycle, makeup area was designed with double-stacked conveyors. This minimized the floor space requirements and also minimized number of operators, yet still allowed loading and unloading on both sides of the wide tray carriers. Pacline offered improvements upon the consultant’s original proposed layout to allow for easy carrier access, balanced access to both sides of the wide carriers and maintain the small floor space combination carton trash, recycle, make-up area. Pacline also provided full project management and coordination with Under Armour®, their consultants, as well as the material handling equipment supplier. Pacline provided complete turn-key mechanical and electrical installation. During the installation stage, Pacline’s experienced installers were able to provided quick, on-site changes and re-routing of their overhead conveyors due when belt conveyor bed interferences were identified in field. 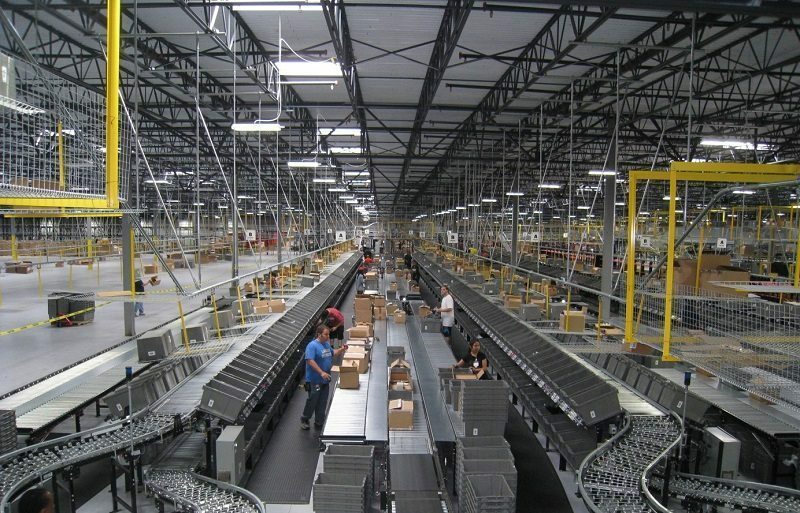 For over 35 years PACLINE has been helping customers of all sizes automate their warehouses and distribution centers with the largest project to date installed at the Barnes and Noble distribution center in Monroe, New Jersey, consisting of 17 Pacline enclosed track conveyor loops which together totalled 3.4 miles in length.